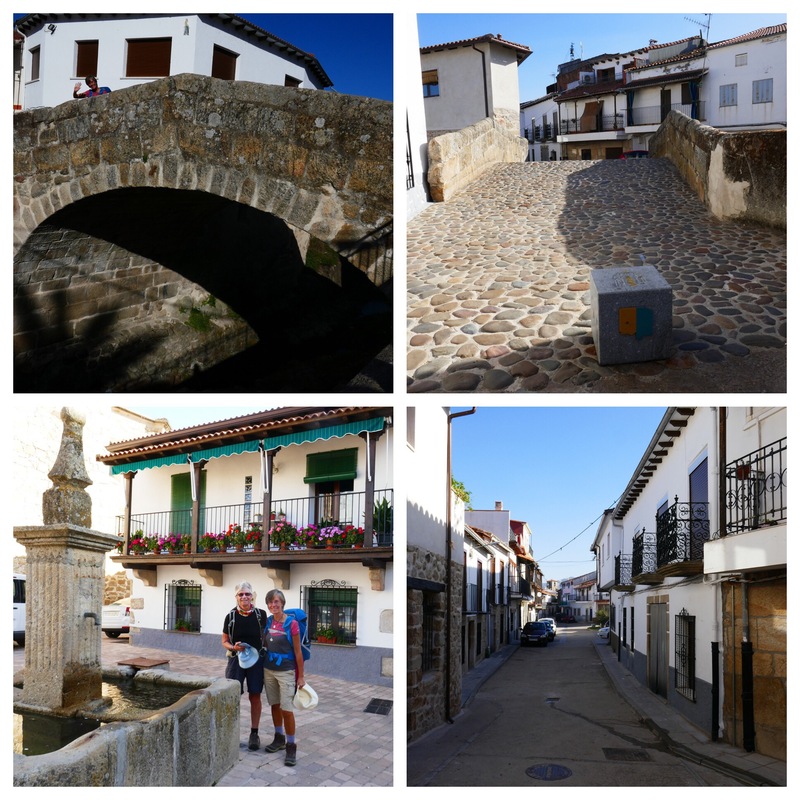 We walked from Hostal Asturias along N630, a north-south road, to one of the best little towns on this section of the Via de la Plata, Aldeanueva. Aldeanueva predates the Romans, was then part of their network of towns connecting north and south Spain and is the most delightful place. 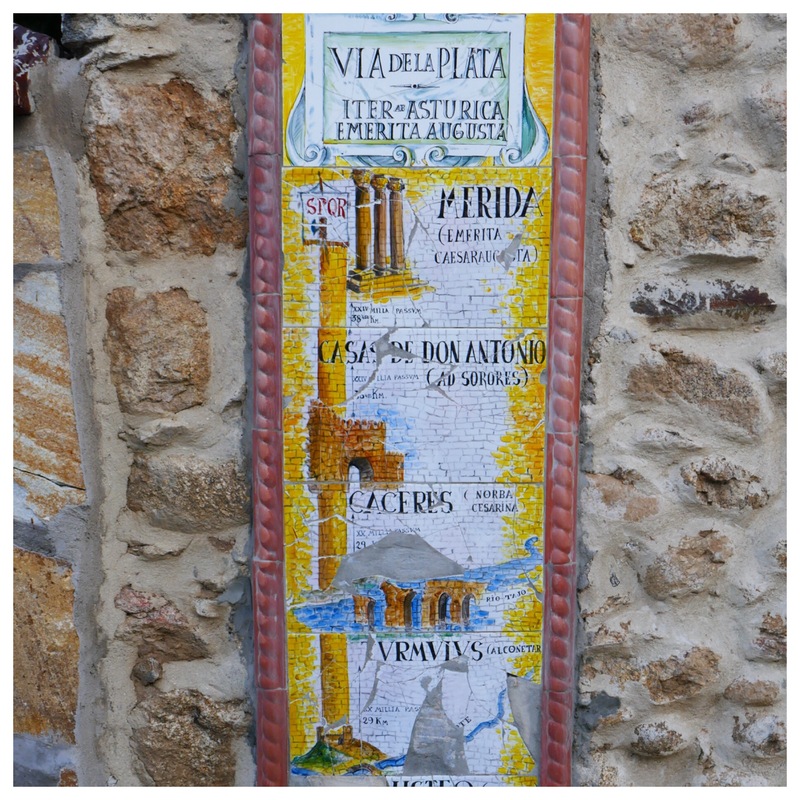 Plaques showing the roman towns exist in the entrance and exit to the town. We wanted a photo of us both with the first one. Grabbed a little old lady to help us. She has clearly never used a camera, had little concept of viewing an image on a small screen or was nearly blind and just couldn’t get it. V was in her element patiently explaining how to hold the camera level and pointed at us while pressing a button. I’m not sure our assistant ‘got it’ so much as accidentally waved and pressed at the right time. She was a sweetie though, quite nonplussed to start with as she thought we wanted a photo of her and she didn’t really want one taken. The town gets more and more attractive as you walk to its central plaza. Balconies with plants, some narrow, old, curved streets and then the centre. And a churrería. I am walking with an ‘addict’ so we stopped. 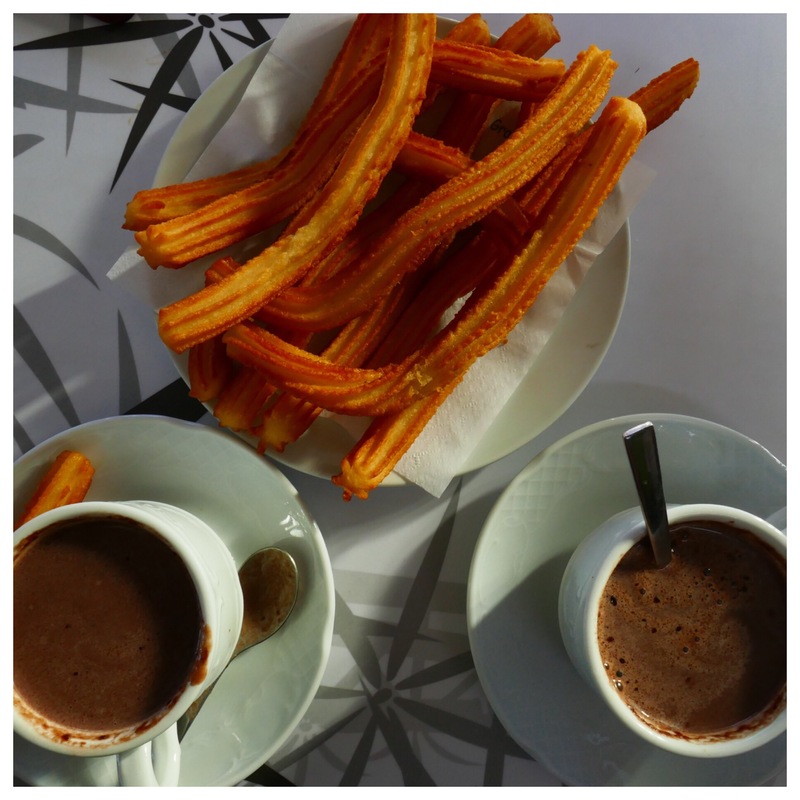 I really enjoyed both the churros and thick spanish chocolate today. A small arched bridge in the centre of town joins both sides of the town. Wow! More beautiful streets and houses and a very old church, with the Rosary being said as we passed. So we didn’t go in. At that point a local offered to take photos of us. How, you might well ask, did I not know about this town? I walked through it 4.5 years ago! 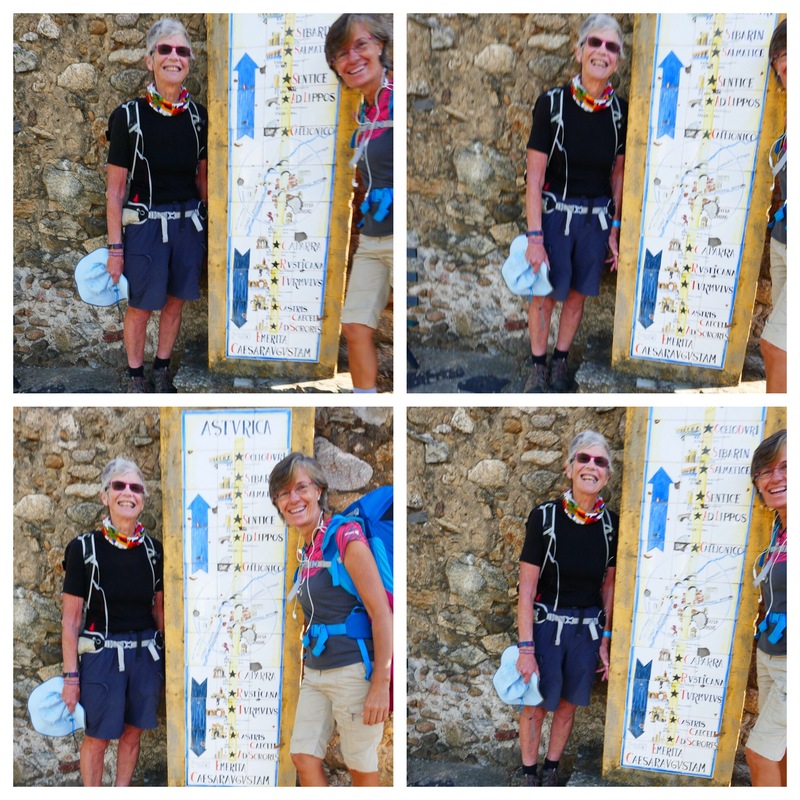 But, E and I were walking 30+km days and going from A to B. So we continued up the N630 road, bypassing this most beautiful town. 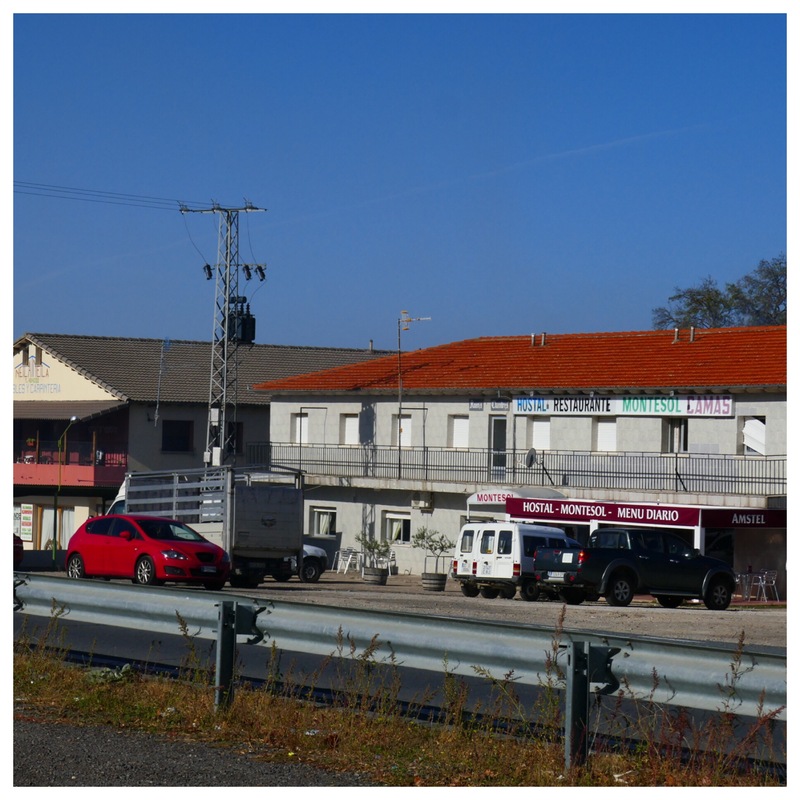 We ate at one of the impersonal restaurants alongside the road. Uninteresting. Yes. Very and so different from today. Next time I walk this section of the camino I’m staying in Aldeanueva and, visiting a nearby town called Hervás, an old Jewish town. I wasn’t looking forward to today as I knew most of it was on the highway, the N630. But, I wasn’t exhausted when we arrived. Why? Fitter, perhaps and it was only 20km, not 30+. I was able to appreciate it all so much more. Last time here E and I had the works at the thermal baths. I nearly froze and wasn’t interested in a repeat. We are staying in Hostal Martin, very pleasant and not far from the start of tomorrow’s 20km to Valverde de Valdelacasa. Albergue there is booked. We are on the countdown to Salamanca when we go our separate ways: V to Santiago and beyond, me to Madrid and maybe Toledo for a few days before flying home. She has made the past few weeks such fun. We get on very well and travel together easily. And she speaks Spanish properly! Meeting her has contributed immensely to this camino for me.